These guidelines outline how records can be managed effectively, retained for the required period of time, and disposed of properly. Record - information created or received that provides evidence of decisions or actions of UQ while undertaking its business. These guidelines apply to staff undertaking all aspects of University business. This incorporates records in all formats including hard copy and electronic, including records in business systems, databases, spreadsheets, websites and email systems. A commonsense and risk-based approach should be taken to ensure that records are captured and managed appropriately to support good corporate governance, compliance with legislative requirements and mandatory standards. 5. Why is Recordkeeping Important? Identifying where records belong, who is responsible for them, who might need them and how they might need to be accessed over time are all important considerations when determining the best way to manage records. Certain types of records are managed in specialised ways using the University’s official Electronic Document and Records Management System (eDRMS) called Records Manager (RM). Student files are electronic and include records of a student's admission, enrolment, progression and graduation. The contents of a student file complement the information maintained in SI-net . Authorised staff can access these files via RM or through a link to Student e-File in SI-net . Emailing recordsmanagement@uq.edu.au , ensuring that the unique student number and a meaningful title are entered in the subject header. Emails and attachments will be registered automatically using the information provided in the subject header. Forwarding completed paperwork to the RAMS  Office for scanning and registration. Registering the record directly into RM. HR  staff can register records to a staff file by sending paperwork to Staff Registry by weekly collection or through secure bags. Paperwork not approved for inclusion on the official staff file should be managed locally. Agenda and minutes of major committees are permanent records and must be carefully managed. Committee secretaries should contact RAMS  to arrange for the registration/transfer of these records. Legal matters from both the Legal Office and the Research Legal Office are often created in Visual-Files and the record is stored in RM. A limited number of areas like the Senior Executive Group, Student Misconduct and Research Integrity use RM to register records. Funding applications are managed by a combination of systems including Research Master and RM. Using an eDRMS like RM is only one way to manage records. You don’t necessarily need to implement one dedicated recordkeeping solution like an eDRMS. Recordkeeping solutions may be any fit-for-purpose applications that have a recordkeeping functionality. A commonsense and risk-based approach should be taken to ensure records are identified and captured, particularly high-risk or high-value records. These are records that are essential for the ongoing business of the University and without which the University could not continue to function effectively or protect its interests. When undertaking a risk-based approach to records management, consideration of the stability and accessibility of the system holding the records should be considered. Where the system requires expert review or is known to be insufficient, RAMS  will provide assistance to assess or transfer the records to an appropriate platform. Ideally all records would be managed in an electronic document and records management system but effective management of records at the local level can be achieved by ensuring that full and accurate records are retained for the period required for business, legislative, accountability and cultural purposes. Some records are more important than others so special attention should be given to those which have significant value, whereas other records of less value or importance require proportionately less attention. Examples of high-rish or valuable records include: Agreements and Memoranda of Understanding, OHS incidents, misconduct issues, committee agenda and minutes, strategic plans and reports, core financial and personnel data, bequests, academic grades, disaster management and business continuity plans, University rules, patents, ownership of physical and intellectual property, insurance and licenses. 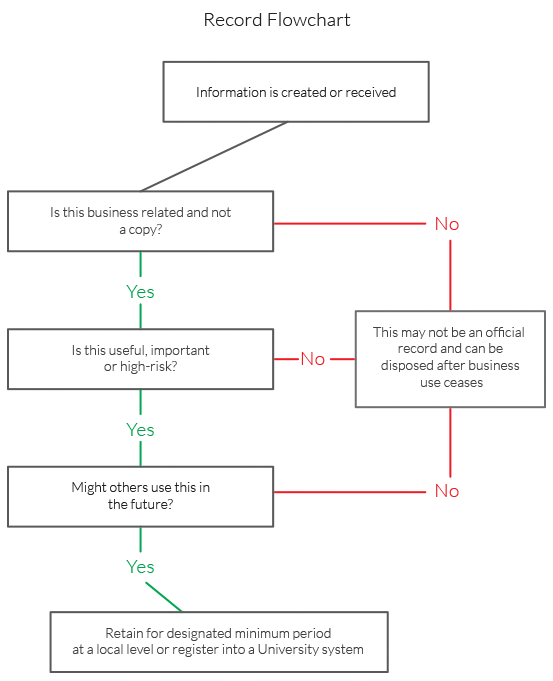 The following flowchart should be used to determine what is a record. 8.1 Where should records be kept so they can be found when required? Managed at the local level in fit-for-purpose applications. Paper records (manila folders, ring binders, filing cabinets and archive boxes with reference guides). 8.2 Where should records not be kept? These are not suitable places to store vital records as there is restricted access to information or no back-up. 9. Hard Copy or Electronic? Information which is born digitally should be managed that way. To improve the reliability and authenticity of documents the final version of a document should be converted into a PDF format to prevent future untracked alterations. Once identified as a record, the University's Business Classification Scheme (BCS) can be used to allocate a class to the record which can then be used to determine how long the record needs to be kept. These functions provide the top level names in fit-for-purpose applications. Grouping records under common function names provides easier access, reduces the number of copies and supports improved retention management. Under each function is a series of related activity names, which represent the major tasks or areas of service undertaken within the function. The third level of classification is transaction, which is the smallest or most precise unit of business activity. A BCS can be applied to any collection of records at the local level including: shared drives, Outlook folders and physical filing systems. Document naming conventions should be used when saving documents to assist finding them in the future. A meaningful title consists of terms like project, process, activity or type e.g. response, request for information, report, or brief description of the content of the document. Titles should describe the content in as much detail as necessary. Some records are permanent, but most are temporary and can be destroyed at a later date. Retention Schedules provide the minimum length of time different types of records need to be kept. In all cases PPL 1.60.06 Transfer and Disposal of Records  must be followed when disposing of records.